Many Forest visitors, upon driving the road to Herb Martyr Campground and seeing Winn Falls tumbling 400 feet off the north shoulder of Sanders Peak, start looking for a way to get a closer look. The best way to get a close look, relatively speaking, is via the Greenhouse Trail. 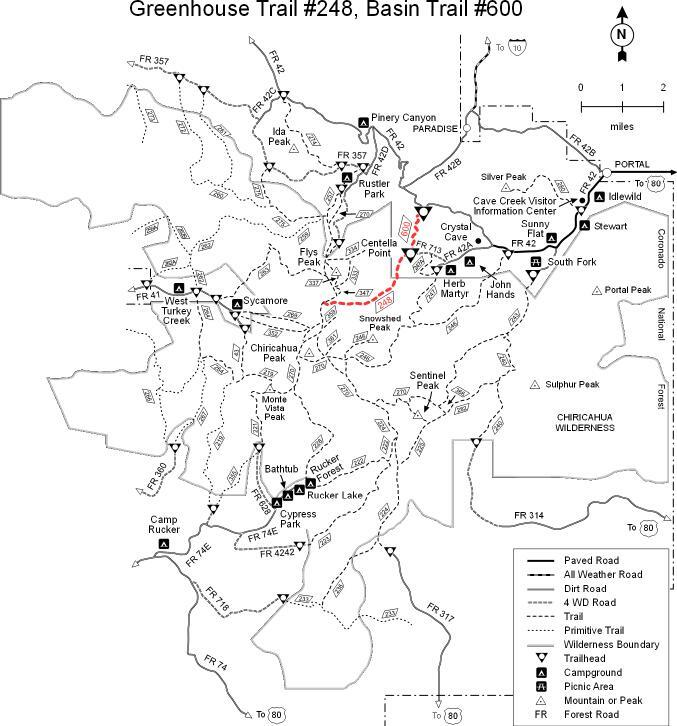 This route from canyon bottom to high country starts at the end of a 4-wheel drive road (FR 713) off the Herb Martyr Road (FR 42A) and switchbacks its way into the Chiricahua high country. Along the way, it passes an overlook that presents a fine view of the falls. Remember that in early summer it's liable to be dry and in winter it becomes a 400 foot icicle, but even if it's only a bare cliff, it's still worth a look. Beyond the Winn Falls viewpoint, the Greenhouse Trail continues climbing to a high divide between Cima and Greenhouse canyons that presents more good views. From this scenic vantage point, the trail follows a more gradual course into a mossy basin where big trees and wildflowers flourish on the moisture provided by a perennial stretch of Cima Creek. In this idyllic setting you'll find a couple of old Forest Service cabins where Forest officers once spent spring and summer. It is a restful spot to view history before completing the last stretch of the 1,600 foot climb to the Crest Trail #270 at Cima Park. An alternate way to access the Greenhouse Trail is via the Basin Trail off Forest Road 42. This friendly pathway follows a moderate gradient through oak/pine woodland, past Welch Seep, to a junction with the Greenhouse Trail at the end of FR 713. The Basin Trail is a good place to see white-tailed deer and other wildlife. This trail is also accessible via the Ash Spring Trail #247A out of Herb Martyr Campground. From Tucson, take I-10 east 139 miles to US 80 (you will cross the New Mexico border to get to this intersection). Turn right (south) and drive 28 miles, then turn right (west) on the road to Portal, 7 miles. Drive west on FR 42 approximately 4 miles, turn left (west) on FR 42A and continue 2 miles to FR 713 (4-wheel drive road). The trailhead is at the end of FR 713. Forest Road 42 is a gravel road suitable for passenger vehicles. It is open April through November. The road is not plowed and is usually closed following snowstorms. The road is rough and dusty and may be muddy and slick after a rain.